It looks like Samsung is not the only smartphone manufacturer that boosts up its benchmark results to get higher scores, AnandTech recently discovered that other major smartphone manufacturers including Asus and HTC are doing the same thing. As shown on the image above, they’ve compiled everything into a table, showing which phone manufacturer cheats in which benchmarking app. 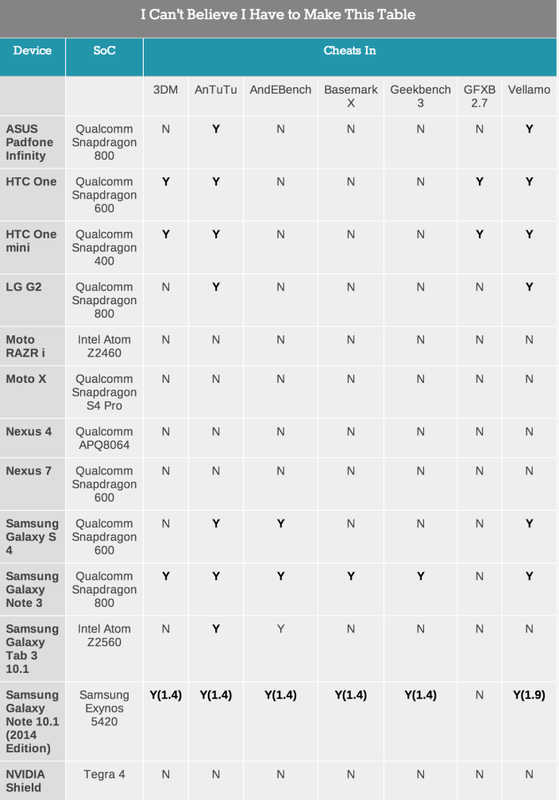 According to AnandTech’s findings, besides Apple, Nexus 4, Nexus 7 and the latest Motorola devices, almost every single OEM they’ve worked with before has shipped before at least one device that has a CPU optimization. AnandTech also pointed out that most of the inflated scores provide less than 10% increase in GPU and CPU performance benchmarks. Visit AnandTech for an in-depth look on the things they found. I have to admit, I never knew what benchmarking was until I started working in this industry, I never bother about these numbers when purchasing a phone then and now, but unfortunately to some, a better score means a better phone and that’s probably why all these phone manufacturers are still pulling stunts like this. Anybody here actually purchase a new device based on these scores?